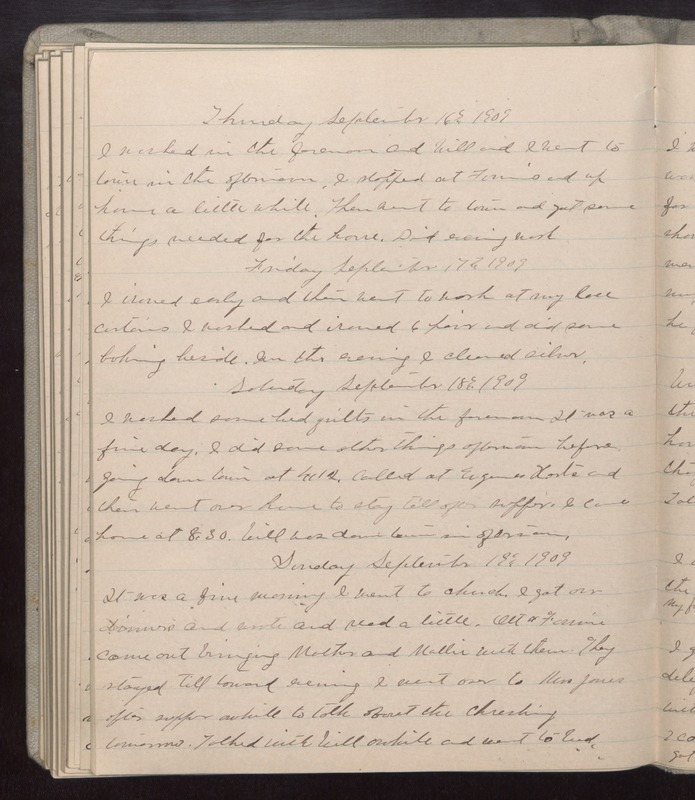 Thursday September 1th 1909 I worked in the forenoon and Will and I went to town in the afternoon. I stopped at [Fannies?] and up home a little while. Then went to town and got some things needed for the house. Did evening work. Friday September 17th 1909 I ironed early and then went to work at my lace curtains I washed and ironed 6 pair and did some baking beside. In the evening I cleaned silver. Saturday September 18th 1909 I washed some bed quilts in the forenoon It was a fine day. I did some other things afternoon before going down town at 4.12. Called at Eugene [Harts?] and then went over home to stay till after supper. I came home at 8.30. Will was down town in afternoon. Sunday September 19th 1909 It was a fine morning I went to church. I got our dinner and wrote and read a little. Ott & Fannie came out bringing Mother and Mattie with them. They stayed till toward evening. I went over to Mrs Jones after supper awhile to talk about the threshing tomorrow. Talked with Will awhile and went to bed.